I like ghost stories as much as the next girl. 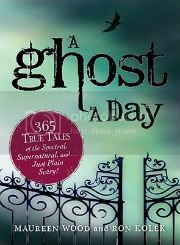 Hey, I probably dig them more than the next twenty girls you’ll find, so I was delighted to get my paws on A Ghost a Day: 365 True Tales of the Spectral, Supernatural, and…Just Plain Scary! by Maureen Wood and Ron Kolek. Wood studied metaphysics for more than 25 years, Kolek is the producer and host of a ghostly radio show, and they both work on The New England Ghost Project. All in all, this sounded like a fun and somewhat campy book to curl up with on a dark, stormy night. Well, it isn’t. While I was intrigued by the premise of what I thought sounded like an ambitious overture, I was quickly disappointed when the tales came down to, “There was a man who was mysteriously killed on a country road. To this day you can hear him pacing and wailing outside!” In order to cover 365 days of paranormal tales, this book picks up its skirts and races right over each story. The average tale consists of two or three paragraphs that quickly gloss over the major highlights of the alleged haunting. Even familiar stories that had already garnered my interest (such as Bobby Mackey’s Music World, for example) were tedious in this form. Simply put, it was impossible to flesh out so many stories in a satisfactory manner without turning this average-sized paperback into a giant tome. On the plus side, it’s an attractive little book that might make a great gift for somebody who is wetting their toes in the paranormal pool. The lack of detail, while frustrating to me, would actually delight my friend who is drawn to ghost stories but doesn’t want to deal with “any of the dark stuff.” There simply isn’t time to delve into any of the dark stuff. Also, each day of the year is significant to it’s assigned story. It’s fun to look up your birthday and see what tragedy unfolded. Many of the tales were unfamiliar to me, and while most seemed to be set in America, many came from across the globe. These tales in particular piqued my interest. I also enjoyed some of the Terrifying Tidbits, brief ghost-related facts, that were sprinkled throughout the work. A Ghost a Day is a sanitized primer of all things ghostly. 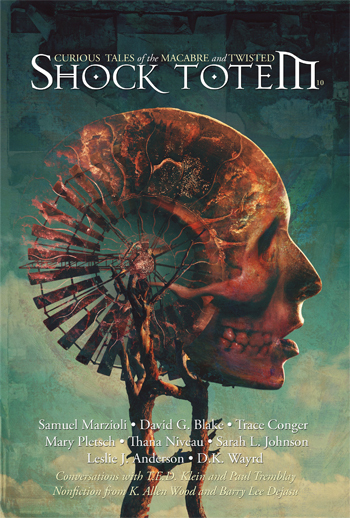 Think of it as Ghost Stories 101 and use it as a reference book to turn you on to tales that you might not currently be aware of. Then research those incidents on your own, because you’re certainly not going to find enough information here. This entry was posted in Blog, Book Reviews, Reviews and tagged A Ghost a Day, A Ghost Story for Every Day of the Year, Book Reviews, Ghost Stories for the Easily Frightened, Maureen Wood, Reviews, Ron Kolek. Bookmark the permalink. Wait, this isn’t even my antho. I’m not even in it. Where am I? What are you doing with that dental drill? Don’t I get a phone call before youWRRGRRBBLLLLL!